It’s 7:30 in the morning in Rio de Janeiro, Brazil. The hostel’s cat just came to say “Good morning” and I just finished my night shift on the WPMU DEV forum. It’s my third day in Rio after spending the last 40 days in Bogota, Colombia. Traveling is in my blood or at least, it is now. I’m a full-time digital nomad and I have been for over a year now. I’m single, I’m female and because of WordPress, I can travel around the world and work at the same time. I started using WordPress in 2009, but I like to think that everything started in 2011 when I attended my first WordCamp in Poland. I remember I was extremely shy, scared and bit lost on the first day of WordCamp. It was a different world to me or at least in contrast to what I had at home – a small city in South East Poland. It was different because for the first time in a long time since college, I felt like I fit in with everyone there. They were a right fit for me and so was that place. Since that first WordCamp, I also attended many more in Poland as well as in other countries. Later, I went on to be the lead organizer of WordPress meetups in Wrocław and two WordCamps in Poland. I was also a speaker for many Polish events and for one WordCamp Paris. If not for the WordPress community and the friends I met on that very first WordCamp, I wouldn’t have been able to achieve any of those accomplishments. But how could I have become a full-time digital nomad, you ask? In 2015, I was stuck. I had a great, steady job in Wrocław. I was working with WordPress and everything was perfect, at least, that’s what I thought at the time. I achieved almost everything that society around me was expecting: a partner, apartment, a great job and the next step would have been getting married and having kids. Suddenly, I was sinking. For a year, the only moments where I was truly happy was when I was attending WordCamps and WordPress meetups – when I was with my “tribe”, my friends. Then, in May of 2015, something incredible happened: one of my friends sent me a link to a list of 70 companies which offered positions working remotely. Three of them were related to WordPress: Automattic, OnTheGoSystems and Incsub. That same day, I feverishly filled out an application for a position as a Support Star at Incsub, the parent company to WPMU DEV. After a wait full of agonizing anticipation, I finally got the job and six months later, I bought a one-way ticket to Japan, then one to Australia. This was just the start of my life as a digital nomad. Working at WPMU DEV remotely with partial dedicated hours and the rest being flexible allowed me to move and work while traveling. The people I work with comprise the best team ever. My boss, Tim, is incredibly supportive and is willing to help when something bad happens. I didn’t need to be worried about my job when my plans suddenly made a turn for the worse, which did happen. When I had to fly back to Poland in the middle of the week due to family emergencies, it wasn’t a problem. I always felt safe in the WordPress community and now I’m grateful to also feel safe with the people I work with even though we’re spread out across the globe and across many cultures. Even though I’m confident in my choice of being a digital nomad now, that wasn’t always the case. This was especially true since I apparently managed to make quite the big scandal in my hometown because “good girls” don’t run away. How could I not want that? After all, that’s supposed to be the dream of every woman, right? That’s what I was constantly told, anyway. Since then, I stood with my decision to finally be free and happy. Growing up in small city and being interested in computers and IT was not easy to say the least. Those aren’t traditionally considered subjects that interest girls. It also became all the more difficult when I realized this was something I wanted to do and nothing else. There weren’t many people around me in my hometown who understood what I wanted to do and even fewer people who would support me. Unfortunately, this is still true. It became tougher when I was diagnosed with heavy bipolar disorder. At that time, everything sucked. I was lost and hopeless. Compounding my stress, it was around then that I realized I also suffered from the impostor syndrome – the belief that you don’t know enough about the industry you’re in to be capable of doing your job and that you never will despite anything you do. There was an ugly feeling that crept in: I wanted to be somewhere else and I want to be different. Fortunately, every time I attended a WordCamp or WordPress meetup, these thoughts would melt away because I felt completely supported. It didn’t matter that I’m a girl or that I’m delightfully weird. What did matter was that I was knowledgeable about WordPress, my skills were growing quickly and that I could contribute to the community using my organizational skills. During these meetings, I don’t ever remember someone assuming that I’m a graphic designer because I’m a girl and “girls know color.” There’s nothing wrong with being a graphic designer, but assuming someone is based solely on their gender – there’s definitely something wrong with that. In reality, I’m a theme developer and in the WordPress community, that wasn’t unusual. It helped me gain confidence in myself and my skills. With that confidence, I found courage to start a life where I’m no longer wanting to be somewhere else or be someone else. 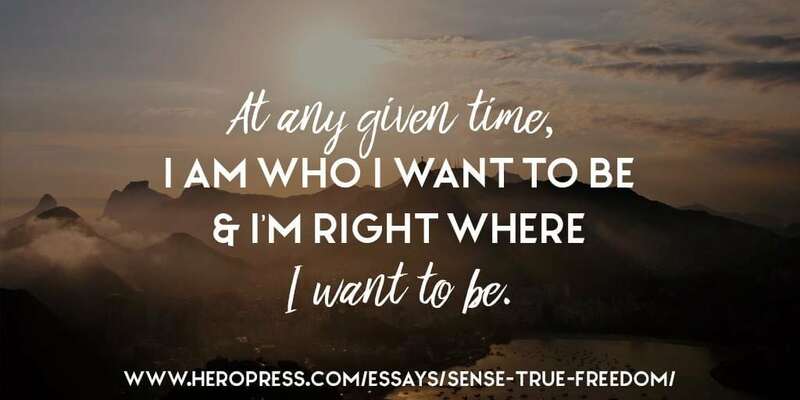 At any given time, I am who I want to be and I’m right where I want to be. Solo traveling isn’t always peaches and cream or sunshine, lollipops and rainbows everywhere, especially when I’m sick and inevitably alone. All things considered, I wouldn’t swap it out for what many would consider to be a “normal” life – whatever that is – and instead, I think it’s important for people to do what makes them happy and not just what others expect of them. As a digital nomad, I was able to go to WordCamps in Tokyo, Belgrade, the US, Singapore and Vienna. I have met many new people and I have collected incredible memories along the way. This year and in many more to come, while others may doubt my choices, I’ll be happy, traveling to more WordCamps and enjoying a sense of true freedom just because I can. The post A Sense Of True Freedom appeared first on HeroPress.